Biz Collection Poly Cotton Polo Shirts for top performance at work or for teamwear. Features 35% Cotton and 65% Polyester which provides comfort and great appearance with a large choice of colours available. 65% Polyester. Contrast shoulder panels and side panels with quality piping finish. Features a nicely finished twin button panel. Comfortable fabric to wear. Flattering ladies style up to Size 24. Superior resistance to shrinkage and colour loss. A matching range of JACKETS, SHIRTS, CAPS and SPORTS BAGS is also available. 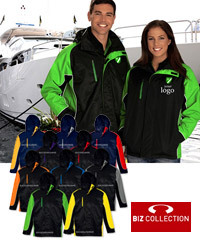 Your logo can also be used on Jackets, and Shirts etc. Womens: 8. 10. 12. 14. 16. 18. 20. 22. 24. Please allow 2 to 3 weeks delivery or please advise your deadline.